"He lets you find your own way, but the marvelous thing about him, which most directors can't do, is if you get into trouble and you come to the director and say 'I'm in trouble,' the director sure as hell better know how to get you out of it. And that's what he can do." 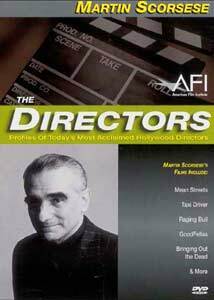 This volume in the continuing series The Directors is one I've been waiting for; Martin Scorsese is one of the most articulate and visible exponents of our cinematic heritage. This volume doesn't disappoint, for we get significant insights into Scorsese's working methods, his philosophies and intentions, beginning with his apprenticeship with Roger Corman, through the controversies of Last Temptation of Christ up to the present day of Bringing Out the Dead. As always, interview segments with Scorsese and others are interspersed with substantial film clips from most of his films. The discussion of Raging Bull is particularly interesting, with Scorsese's discussion of how the camera work was structured and the significance of when the camera is in the ring and when it is not. It doesn't take an eagle eye or a film degree to notice a conspicuous omission in the list of those taking part in the interview segments. Robert De Niro is nowhere to be seen. At first, one might think that it would be impossible to do a program on Scorsese without involving De Niro, who has been in the majority of Scorsese's films. But when one considers that De Niro appears in many of the film clips, if he were also interviewed the program would become the De Niro show. Whether intentional or not, director Robert Emery's omission of De Niro helps keep the focus on his subject, Scorsese. The interviews are uniformly interesting; most telling is the mutual admiration society between Scorsese and Jodie Foster, who demonstrates a real appreciation to him for making possible her transition from a child actor to and adult actor. At the same time, Scorsese recalls her as being far more professional at 12 than he was then, and possibly even more than he is now. Paul Newman's high regard is also quite clearly sincere and heartfelt. Scorsese interestingly doesn't approve of the notion of a "director's cut," except in cases where the studio takes the film away and recuts it (the unmentioned model being Terry Gilliam's Brazil). His attitude that once the film is released, that's it, is refreshing in this day of "special editions" that rewrite the film and digital erasure of guns. While a substantial number of Scorsese's films are now available on DVD, seeing this documentary really whetted my appetite for more: the lush New York, New York and the wicked King of Comedy come to mind, as does the frenetic After Hours. If I had any criticism of this program, it would be that it's too short, cut to fit into a one-hour time slot. There has to be additional interesting interview material, and even more clips would be welcome indeed. Other films excerpted include Mean Streets, Taxi Driver, Alice Doesn't Live Here Any More, The Color of Money, After Hours, Goodfellas, Cape Fear, The Age of Innocence, Casino and Kundun . A highly interesting look at one of our greatest directors. Image Transfer Review: The interview segments are all crisp and clear with good color. Blacks are quite nice as well. The color and sharpness of the film clips are somewhat variable, but all quite watchable. Taxi Driver in particular seems rather washed out. Oddly enough, though Scorsese is such a proponent of film, not all of the film clips are presented in their original aspect ratios. The early films, up through Raging Bull are all shown in proper aspect ratio (with the possible exception of Boxcar Bertha, which I believe was originally full frame as shown here), as are all the later films, from Goodfellas on; the four 1980s films are all presented in pan & scan. I would have much rather had all the pictures presented properly, and am surprised Scorsese would allow these butchered clips to be used. Audio Transfer Review: The audio is a passable 2.0 DD mono. Everything is quite clear and easy to understand. There is occasional light hiss, and there is occasional mike noise, but overall a satisfactory audio track for a television program. Weblink to http://www.winstarvideo.com/dvdform.asp for subscribing to a DVD newsletter. Extras Review: Once again, the opening trailer for the Directors series on VHS and DVD; is forced and cannot be skipped, fast-forwarded or defeated (except by stopping the disc altogether and going to the menu from there). This is a highly annoying addition which was absent on earlier volumes in the series—this is a step in the wrong direction. A three-screen "selected filmography" is included, as are four screens listing the awards and nominations scored by Scorsese's films. Otherwise, there's not much here. One can subscribe via the net to Fox Lorber/Winstar's DVD newsletter, and the chaptering is almost adequate. No subtitles are included. A solid look at one of the best directors working today, with well-selected clips and interesting and revealing conversations on filmmaking. Highly recommended, although the running time and lack of extras probably suggests a rental rather than a purchase.